You might notice my last post was several years ago, especially since I’m pointing it out. I debated letting this blog continue to languish in the blogshpere, and starting a fresh new one. But, looking back at some of the posts, I realized they’re still relevant. And that’s a sign of good content. Topics that stand the test of time are good foundations for learning and continued audience engagement. This one from 2006 She’s a Leader? He’s a Leader? featured Donald Trump, and his questionable behavior in his feud with an equally brazen Rosie O’Donnell. I believe my recommendation was he (and Rosie) attend charm school. Who knew his somewhat insensitive demeanor would now be prime media fodder as a leading contender in Republican presidential campaign? It remains to be seen if Trump is a distraction – a clueless buffoon. Or an uncensored voice reflecting a certain segment of American society. Good chance there will be more opportunity for discussion on this. In fact there’s a lot of chatter going on right now following the first Republican debate. Trump garnered perhaps more than his share of attention and the reactions vary from CNN’s headline, No one eclipses Donald Trump at GOP debate to the Federalist’s list, 10 Worst Donald Trump Moments from The 1st GOP Debate. Is Donald Trump’s leadership style adaptable? Can an undiplomatic, not politically correct individual serve effectively as head of United States Government? Does he have enough business sense beyond following trends and knowing how to work the system to help build the economy and balance a federal budget? Seems right now that doesn’t matter. According to a WSJ article published the day after the debate, And, love him or hate him, people on Friday were still talking about him. Google Trends listed Mr. Trump as the most-searched candidate after the GOP debate. Whatever one thinks of Donald Trump’s leadership style, it’s clear he is relevant. I’m certainly not endorsing him, but neither will I disregard him. He may be an ace for social media content, but I think more of a wild card for the 2016 Presidential campaign. I”m a pretty good blogger, although not consistent. I have only 25 friends on FB and 20 connections on Linkedin. I know how to do email blasts without spamming, and proper email etiquette. I’m all but a neophyte on Twitter. Okay, I know a little about about social media. Not sure it’s at the level to be called wisdom just yet. But in the spirit of collaboration with one of the first true social media leaders, Liz Strauss of Successful and Outstanding Blog, who I met a couple of years ago, I’m doing this 25 word writing project. The topic – social media wisdom. She’ll collect all the entries into a meaningful summary. My contribution: Connect by FB with friends and family. Twitter to spread news, follow and RT. Blog to share and niche. Linkedin for business. Email’s almost old. That’s it short and sweet. But, there’s more to learn. Bing is new, and an iPhone may come in handy. Some day soon there will be an electronic channel that will let all of these methods stream together. It might seem overwhelming to some. Others wonder if it’s impersonal. But, my experience is that social networking and media enhances the physical relationships I have established, and opens up a world of electronic relationships I never would have known. Improved communication builds knowledge, develops new ideas and leads to wisdom. When I was a kid I had the opportunity to be a CIT (counselor- in- training) at a Girl Scout day camp. A couple of summers later I was a Sr. Counselor at an overnight co-ed camp in New Hampshire complete with horseback riding, tennis courts and swimming. These were some of my first lessons in leadership. As Nature Counselor, my responsibilities included keeping my group together on hikes, knowing what to do if someone fell and got injured, and imparting some sound ecological tidbits. I also shared responsibility with another counselor for a cabin full of 8 girls. This involved everything from making sure everyone got up and got to breakfast in time to comforting a homesick camper. There were occasional disputes. But, in an atmosphere filled with carefree, fun activities complemented by three home-cooked meals a day; they were few and far between. In general it was a safe, nourishing environment for all. Most were sad when the summer ended, and looked forward to returning the next summer. Horseshoes provide some sport. Though the camp is located by the Providence River, I don’t think swimming is allowed. It appears the chief handles his responsibilities well, “In the last couple of hours the chief has resolved a conflict about tarp distribution, hugged a pregnant woman who mistakenly thought she had been kicked off the island, conferred with outreach workers and helped with dinner preparations. He is also thinking about tomorrow.” Summer camp always ends, like it or not. And, as this article explains they will not be able to stay at this location much longer. Plans are being made to move. Some may find other places to stay, and the chief will soon lead the rest to their next temporary spot. I recognize the parallels in leadership experiences here to my summer camp of years ago. But, that’s where the similarities end. Thankfully, leadership knows no bounds, even when society does. That’s very good advice for anyone in the workforce these days. And, it sounds like a lot more fun than climbing a ladder! Personally, I don’t like heights, and the narrow physical boundaries one feels on a ladder. On a ladder one has to follow behind the leader, and can’t climb any higher until the one in front moves up. On the jungle gym, there’s room for collaboration and crossover as one swings over laterally or to pass by someone who is content to just hang out. I think moving around on the jungle gym calls for more agility and momentum, than climbing the ladder. Yes, the jungle gym is a great metaphor for creating a fun, creative and innovative career. Now, get down off that ladder! Most of us in the Northeast are awaiting the revival of sunshine and warmth, along with all of us in the U.S. awaiting econmic revival. I figure I’ll start my part by revviving my Blog. I left it in the dust while I took a different course than I had expected. I went to work for a small start-up. One that has done surprisingly well despite the tough economy. But, sooner or later most new adventures lose their luster, and it’s time for renewal and redirection. What better tune than the old song, “Have You ever Seen The Rain?” by Creedence Clearwater Revival “Someone told me long ago, there’s a calm before the storm. I know it’s been comin’ for some time. When it’s over, so they say, it’ll rain a sunny day.” to herald that. So, here I am with the weather, the economy, and me – in line for a revival. Now, the weather forecast promises sunshine and hot weather by the end of the week. Not a long wait at all, unless you look back in the calendar at how many rainy days we’ve already endured. Some economists are predicting the economy will start to turn around any day now. According to Boston.com the Bay State (MA) gained 5,000 jobs in May, the biggest monthly rise since Jan. of 2008. Based on research and analysis many expect the recession to end in the next several months, although they caution it will be a slow recovery. Who am I not to go along with these good omens and believe that very soon, I too will experience the joy of it raining sunshine? But, to help my chances I’ll be making regular posts, upping my LinkedIn use, sharing info on Twitter and just plain working on a new-fangled, old-fashioned revival! What can we learn from a dragonfly (aka darningneedle, mosquito hawk) ? One thing is that it takes a loooo…ng time for the larva to mature into that delicate iridescent beauty it becomes as an adult. Some stay in the larval state for up to four years. Then, after instinctively knowing when the time is right to emerge, it’s all but over. The adult dragonfly flies free for just a few months. Dragonflies have some pretty sophisticated engineering in their flight patterns. They can hover, accelerate quickly, fly in tandem or even go in reverse. They do this while effectively completing their mission in life of eating mosquitoes, flies and other insects. Another take on this is one of transformation. 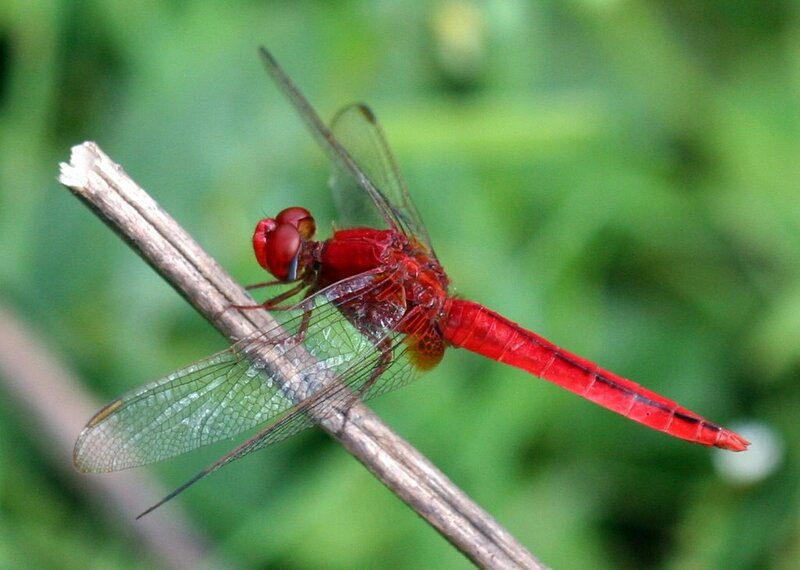 The dragonfly is a symbol of many different things in art and culture – light, adaption, and achieving balance. All good leadership traits. Can you think of some other Dragonfly Leader traits? Unlike Charlie, I can return. Although it’s been a few months since I’ve posted, I have, in fact never really left the blogshphere. On my occasional visits to my languishing blog, I was always surprised to see that people were still visiting regularly. Some following links from other blogs where I was still counted among the live. Some, who were evidently researching Julius Caesar and Veni Vidi Vici. (one of my most popular posts, but I think it might have more to do with Julius than me. ) And, some actual loyal followers who sent me emails asking when/if I would return. They missed me! Even, a few real live people approached me and asked when I would return. In another way, my story parallells the mythic Charlie and the MTA. While anyone who wanted to find him had only to ride the subway; anyone who wants to find me has only to ride the electronic highway. Blogs can be taken down. But, more often than not we aren’t in control of our electronic presence. If one has left comments on other blogs, joined social networking sites like Facebook, or had work published electronically, among other things there’s a trail to follow. Then there’s all the other new stuff (to me anyway, being a lapsed blogger) like Twitter, StumbleUpon, Plurking?? and who knows what else. Charlie’s fame lives on by way of the Charlie Card which carries value for rides on the MBTA. If you want your fame to live on with added value, be careful in leaving an electronic trail. This memo from Leadership Development offers a brief summary of how to do that safely, explaining “everything you do on the Internet can be made public, and the world is watching” . Which leads me to close with this –Watching YouLove this song by Rodney Atkins! There’s a good lesson there for anyone who is ever in a leadership position – electronic or otherwise. Most of us know exactly what our favorite brand is when it comes to Pepsi or Coke (Pepsi for me, but gave it up a few years ago). If asked what brand sneakers, jeans, electronics, cars etc. they prefer most people can rattle off any number of well-known brands and even defend their preferences. But, when it comes to naming and, perhaps going a step further to define or defend one’s own brand many of us are at a loss. Some may wonder if and why they would even need a personal brand. We all have a brand, like it or not. If you’re interested, at all in learning more about branding, and especially in more clearly defining or perfecting your own brand; I suggest you register for A Brand You World: Global Summit. It’s a free teleconference on Thursday, Nov. 8 featuring some of the best marketing experts and relationship builders around. Jason Alba of Jibber Jobber fame is one of the speakers. Check out his post where he shares some valuable insight about the international panel of professionals with whom he will be rubbing phone lines or maybe I should say sharing wireless connections. I’ve watched Jason build his brand over the course of the last year, and I’m impressed. Looking forward to some good inspiration and gaining expertise in honing my own personal brand. Okay, I’m back! Veered off MY Road for a few, as described in previous post of Where does your road lead. Been taking some side roads, detours and even got on a main thorouhgfare for a few. That’s important to do sometimes to gain perspective or seek out new ways. But, it can also lead to dead-ends and abandonded paths. Below, in italics, I’ve copied the original exercise for this post from Liz Strauss’ Successful Blog. One thing that very much surprised me in the responses to her post was that most people, when confronted with the wall at the end chose to veer off the road, stop or even turn around and go back. I’m guessing it shows that some either a) don’t read with comprehension or b) aren’t used to taking ownership of their own direction in life. You’re walking on a road. It’s your road. Tell me about it. As you walk, you pass a body of water, describe it. Directly in your path is an empty bottle. What’s your response to it? You continue until you find yourself facing a wall that crosses your road perpendicularly. What do you do? That’s why I emphasized, My Road! Someone is clearly stating it’s my road to travel and do with what I may. There are many limitatiions placed on all of us in life. It’s surprising to me that many, even in a psychological exercise, so often expect and accept those restrictions. When I travel on others’ roads (be they real or virtual) I must adhere to those restrictions; but on my road I am free! Another lesson I gained from doing this exercise is realizing that any road requires maintenance and attention to new developments that arise. That might also require hiring a crew, and posting regulations. Like now, in Northern New England we’re going into what looks to be one heck of a mud season. Larger vehicles will be restricted and/or fined from traveling certain roads. Garages and auto body shops will see a surge in activity as people traveling on roads rife with frost heaves and potholes unintentionally damage their vehicles. I see it the same for any of us as we travel our own metaphoric roads in life. Sometimes the way is smooth and easy; sometimes rough and impassable. There will always be detours and distractions. There are as many kinds of roads as there are people and places. Some may finish one road to their satisfaction, and branch off into a new direction. Others might turn their one road into a major highway with multiple lanes, exits and entrances. My road, especially through the blogosphere is still new and exciting; but fairly free from restriction. I don’t want to deal with traffic lights or busy intersections, and I know I will take a side road or a trail through the woods sometimes. But, I’ll always find my way back to My Road. Hope all of you are having fun constructing your own roads and taking occasional side trips on mine! Here’s a little creative exercise that all of you right-brainers will probably love, and you left-brainers may attempt to either over-analyze it or dismiss its importance. Lisa Gates of Design Your Writing Life posted it as a Writing Exercise and urged me to create my rendition. Lisa writes a story about her road, and leaves it for you to interpret as you wish (right-brain, creative) She borrowed the idea from Liz Strauss of Successful Blog, who had originally posted it as a Psychological Survey of Attitudes. Liz lists her answers and gives some explanation to the interpretation (left-brain, analytical). Ah, I can already see where my story is headed. My road is a dirt road in the country. But, it’s not at all desolate. There are people who come and go on it every day. I wave as they pass by in their car or stop and talk if they are on foot. The road itself is well-worn and smooth, not filled with ruts and not overgrown or unkempt on the bankings by the edge. As I walk, I pass by a rushing brook that cascades over rocks and churns the water like a faucet turned on full force. Eventually it becomes a steady stream calmly washing over a shallow bed of stones. I thrill with the sounds of its strongset currents, then as I continue my walk I pause to reflect at its quiet flow. Some days I wonder, how can that same amount of water have such a different amount of energy and effect depending where it is along the road. Then I answer myself, realizing, that just like me its reactions vary according to what it encounters on the journey downstream. Finding an empty bottle directly in my path is not a good thing. To me it means that someone was careless and disrespectful of a road that means a lot to me. I also see it as potential danger to other travelers who may trip on it, get cut, or might make the wrong choice and pick it up and toss it to the side. So, I do the responsible thing and pick it up to discard with the recyclables. Or if it’s a blue cobalt one like Lisa found on her walk, I’ll take it home to use as a vase for wildflowers. Finally, continuing down the road, I am told I will encounter a wall that crosses it perpendicularly. My reaction to that is at first surprise. How did it get there? Who put it there? And then, action. I will take it down piece by piece. I’ll do it in a neat and orderly fashion if it’s deconstructable (like rails or rocks), or I’ll do it with some form of explosiveness and help from my fellow travelers if it’s a solid wall. My road may have some distractions and obstacle along the way, but it is always an open road. No blockades, no detours, no walls! It is, after all My Road.